Established in 1989, Phoenix Academy is Western Australia’s premier English Language training facility. 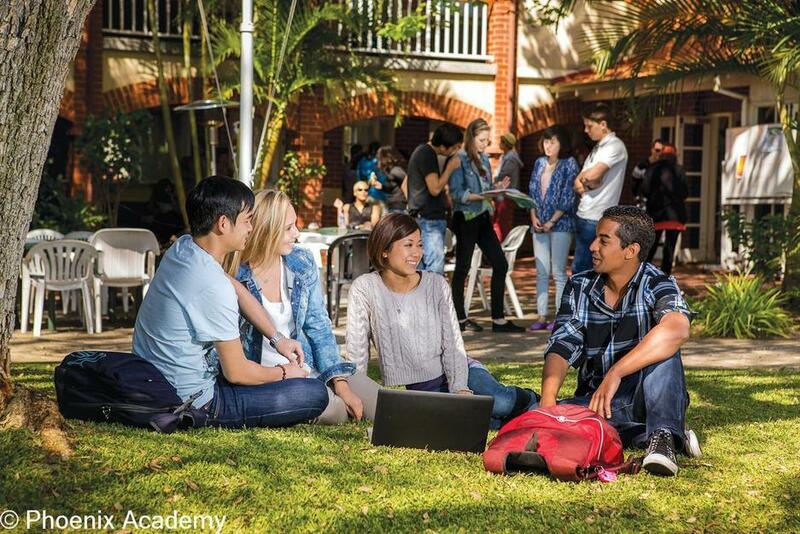 Located in the city of Perth, the Academy is housed in beautiful Edwardian buildings, in a lush, tranquil garden campus and is renowned for its warmth and friendliness. Get the most out of your travel and study experience by living with an Australian family and experiencing the lifestyle first hand. Friendly homestay families with comfortable, clean and spacious homes. Accommodation located no more than 30 - 40 minutes travel time by public transport from the Academy. Modern hostel, located on Perth campus. Single, twin, triple and dorm rooms· Friendly,welcoming staff with great fun, social atmosphere. On-site recreation facilities including: swimming pool, BBQ, pool table & amp; large TV”s with Cable TV, DVD players. Here at Phoenix we offer both the Cambridge First and Advanced Examination Preparation classes. We offer 10, 12 and 6 week courses all throughout the year. The course is taught by our highly experienced and qualified teachers and the certificate is internationally recognised! and can enter university directly. Global Business Skills focus on the soft and hard skills necessary to succeed in today’s global business environment. Courses include a combination of lectures, tutorials and online self paced work. The online content engages students through a variety of interactive exercises, providing a stimulating learner-focused environment that aims to improve learning outcomes, drive student motivation and encourage students to become more responsible for their own learning. Phoenix Academy offers CELTA and DELTA training as teacher training courses. CELTA is recognised throughout the world and is a pre-requisite to teach in many institutions overseas and in Australia. Course dates for CELTA and DELTA can be found in the brochures section or via our website. "High school Preparation" and "Young Learners" caters for those who are looking to enter into an Australian High school or who simply want to improve their English. Phoenix can help students reach a desired English level as well as place student into their desired private or public school. Phoenix accepts students from age 8 to 17 in Junior English programs. The reason Phoenix is such a great place to study is because the campus is beautiful and the facilities around the school such as the e-boards are of really good quality. The teachers are welcoming and all of the teachers here speak English as their first language. My English has improved greatly since i started studying here my boss in Australia has even commented on how much I have improved. I highly recommend Phoenix to anyone who would like to improve their English in Perth because I believe it is the best English School in Perth. Llegué a Phoenix para mejorar mi inglés general lo que me permitió avanzar a inglés académico. Phoenix tiene el mejor personal, todos están dispuestos a ayudarte a sacar el mayor provecho a tu estadía en Perth. También cuenta con los mejores profesores que además ofrecen clases complementarias con enfoque en escritura, habla o gramática dependiendo de que debilidad deseas trabajar. Durante mi aventura en Phoenix he compartido con personas de distintas nacionalidades y ahora tengo un amigo en cada rincón del mundo que espero poder visitar. Sin duda alguna esta experiencia no sólo ha mejorado mi inglés además me ha permitido desarrollar mis habilidades multiculturales y conocerme mejor. Ich bin seit vier Wochen in der Phoenix Academy und habe mich schon sehr gut eingelebt. Die relaxte Atmosphaere und die atemberaubende Architektur der Schulhaeuser lassen einem den altaeglichen Schulaltag wunderbar geniessen. Die angestellten Lehrpersonen sowie die Mitarbeiter der Reception machen einem das lernen leichter indem sie den Schuelern pausenlos Unterstuetzung anbieten. Vor allem Kane, der huebsche, immerfrohe Jungspunt, der als Manager seine Arbeit verrichtet, muntert die muede Meute morgens immer auf. Der Partyhengst weiss wie der Hase laeuft! Ich kann die Schule nur weiterempfehlen und den Lernbereiten garantieren, dies ist der beste Ort um sein Wissen zu erweitern. Llevo en 9 meses estudiando en Phoenix Academy. El curso tiene un buen nivel y me ha ayudado muchisimo a mejorar mi ingles y aplicarlo en un entorno laboral. Esta bien comunicado y siempre hacen mil actividades. He he conocido buenos amigos de distintas nacionalidades y lo hemos pasado genial. 100% recomendable! Il corso e` ben strutturato, tutti gli insegnanti sono preparati e tutto lo staff e` efficiente e molto amichevole. L'atmosfera e` fantastica in quanto si ha la possibilita` di interagire con studenti provenienti da tutte le parti del mondo. In generale mi reputo molto soddisfatto e felicissimo di essere qui.